Use the theme options page to customize all the main design features on the homepage. You can change or altogether remove the welcome message, select which categories show up on the homepage, etc. Sign up for a Free Account to download Mixfolio. If you plan on using Mixfolio, we’d love to see your site submitted to our theme showcase. A Tweet and Like are equally appreciated. Enjoy muchachas and muchachos! Great work… Reinventing yourself keeping the GPP spirit…. Is it possible to show more than 15 latest posts? Not without modifying the home.php/index.php posts_to_show variable. I’m having trouble with drop down menu… I don’t see the css option in menu location. WordPress hides the CSS option by default. Click Screen Options and show the CSS option. I had simple lightbox in my last theme but since the gallery option in posts goes to attachment pages instead of the actual image link – the lightbox doesn’t seem to work. 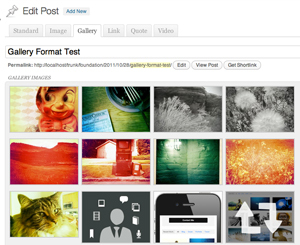 Any suggestions of a plugin to make the gallery posts lightbox friendly? Great them! One question though: comments are closed for individual pictures in gallery post. How do I enable them (like shown here http://demo.graphpaperpress.com/mixfolio/2011/11/03/yet-another-gallery-post/attachment/89888482/ )? The post you linked to is actually a Post Attachment. Each image in a WordPress gallery gets it’s own “attachment” page. Just wanted to clarify that. You can enable comments site-wide on the Settings -> Discussion tab in WordPress. You can disable comments on individual Posts or Pages in WordPress by scrolling down below the Post Editor window and checking the “Show/Hide Comments” box. If it isn’t there, click Screen Options (top right) when on a Post or Page and show the Comments box. Sometimes it’s hidden by default to clean up the UI. Thank you for the reply. Sorry I didn’t get it: so, I upload as a new post a gallery. Do I have to create separate “attachment” pages for each picture of the gallery, and then point to each one with a link from the specific picture? Maybe it’s something obvious, I’m a wordpress newbie – excuse me! Thanks for this theme–it’s very useful but I was wondering how to set a different default featured image so that text-only posts don’t have the ‘Featured Image Missing’ as their homepage thumbnail. Would also be awesome to have the option to make the post title overlay the thumbnail for selected posts. Great, thanks very much–found that just fine. Would you also be able to say whether it’s possible to let the title & meta info appear as an overlay of the thumbnail by default, rather than only on hover? I love this theme! Just what I have been looking for. It would be nice to have the option for Next and Prev page buttons if the posts exceed 15. Additionally, you mentioned changing the posts_to_show variable in order to show more than 15 posts per page. I could not find any such named variable. Where does one find that? The theme doesn’t use a lightbox. You will have to install your own lightbox and implement it. You mentioned being able to shuffle the posts. I cant seem to figure out how. Could you please tell me how? i did! but somehow for me its not clickable.. am i missing something? What OS and what browser are you using? Please make sure you select at least 2 categories for “Categories” option under Theme Options > Homepage. Then you will see different category names next to Recent Work. Clicking them will display only posts for that category. Yes, I have categories, and it works as u have mentioned. But my query is regarding displaying all the categories, and if there is a way to shuffle the order of the posts as they are displayed on the home page? any help would be deeply appreciated! thanks! Where do we find the variable to allow more than 15 posts to show up? You would need to remove or rename the theme-options.xml file in the mixfolio/option-tree folder. Then you can change the Settings of the Theme Options on the OptionTree -> Setting/Config tab. We have tested in IE 7 & 8. The error might be related to a plugin….We will check it out and fix it if it is a bug. Thanks for the notice! Love the theme! Appreciate you guys making it free of charge. I did have a question. Is there any way to center a gallery post or does the gallery have to remain aligned to the left? Can you post a link to your site if it isn’t centering for you? The thumbnails are centered, but when you view the images in the gallery, the single images are aligned to the left. Was just wondering if there was a way to center them when viewing them that way. When I put external links in the welcome message or the contact details box, the theme always adds the address of my site – making the link not work. How can I fix that? The theme options for selecting categories on the front page doesn’t seem to work properly. The home.php file has the following line of code: $category_query = new WP_Query(‘posts_per_page=’.$ta[‘ta_home_post_number’].’&cat=’.$categories)….which I think is trying to pass an array of categories to ‘cat’ instead a list of category ids. This, I believe, is makes all new articles appear on the front page instead of just the items selected from the option tree. Excellent theme. Is there a way I can make the homepage post shuffle use a custom post type and taxonomy that I have created, instead of all posts and categories? That worked very well. Now I just need to work out how to change the categories to a custom taxonomy, in the back end it only gives the post categories as options. Hi, when I try installing the theme I am prompted to install the plugin “OptionTree” with it, but when following the link given in the WP admin area, I get the error message “The plugin has no valid header”. Tried to find it in the WP plugin repository, but no luck. Any advice? Hey there, I absolutely loved this theme so I chose it for my new blog project. I would really like to work with different post formats but only the options “standard”, “gallery” and a third format (whose name I forgot right now) are displayed for me to choose from. How do I solve this problem? I hate to ask a question when you’ve given me something for free – but I’m having trouble getting this theme to work with shortcode (of any type) and Firefox 8. My images don’t do the hover anymore after clicking on a category under ‘recent work:’, in this theme however it works so it does not depend on my browser, also all my media settings, regen thumbnails and other activated plugins were deactivated and checked, but i still haven’t found a solution? 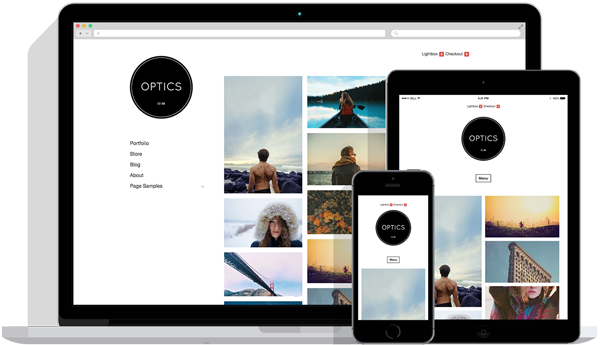 At first I would like to thank GGP for this great free WordPress theme, it’s a style I was really looking for. I like the idea of having the 9 recent post showcased when one visits the site. The recent work bar where one can filter by categories works excellent, but I experienced that it will only filter the 9 most recent post and won’t show older post. Is there any way to index older posts by clicking the ‘filter’ without having to show more then 9 thumbs on the index page? Right now, my older posts can’t be viewed without going to the archive which I disabled because of my design. Is it possible to change the theme options for selecting categories on the front page in a way that it will select all the content from a category so not just the one from the frontpage but the whole site? I’m not sure how to ask this question but I hope it is clear. Hi, I am unable to get my logo to show up. I have uploaded it and stuck to the dimension restrictions as advised but it still shows just the text and no logo image. Is this a bug or an easy fix? Hi. i appreciate you create this theme. it’s my truely love. now, i use it in my personal site,www.sunjaden.com. now ,there is a question,how to achieve a navigation which has the secondary menu?? hope your reply. thanks! Absolutely love this – you guys rock. It’s exactly what I was looking for, looking forward to tweaking this… Huge thanks! Love the theme! Just curious on how to translate the theme to Norwegian? Hey, great theme! I hope you can help with a little problem I’m having. I’m trying to edit CSS for the narrow rectangular box on the homepage. (According to Firebug, the HTML is: ul id=”filter” class=”breadcrumb”. It’s below the Welcome Area.) Firebug says it should be in style.css, but when I’m in style.css through Appearance–>Editor, the code I see through Firebug isn’t there. Is Firebug referencing another style.css sheet? If so, where is it? Maybe that code is accessible through global.css? While the edit page allows access to other CSS sheets, there’s only one style.css sheet and no global.css sheet. I’m a relative novice (as if that wasn’t obvious already) and this is my first attempt to use a theme so any help would be much appreciated. Thanks! may be challenging to place in isolation as well as a possible purchaser should know methods to recognize a genuine product or provider before to producing a purchase. wow! Amazing theme, with all interactive features and functions. I am inspired. Thanks a lot for sharing.. I really like this theme but would like to keep just 3 sticky posts on the homepage. InTheme Options I can choose “Number of Posts” (3,6,9,15) but if I choose 3 it displays 3 posts in addition to the 3 sticky ones. Any idea how to bypass this ? I use WordPress 3.1. Could you please help? You’ll need to update WordPress to the latest version. Is there any way to get the archive to show more than 10 posts on a page. I have the catagories as months, so I want the archive pages to show up to 31 images. I would also like to ask the same question. I want to change the number of posts in a catagory archive. How can I do this? Wendy, I eventually figured it out. Settings/Reading in the dashboard. Simple answer, maybe far too simple for the folks of Graph Paper Press to bore themselves with? Love this theme, but cannot seem to get the navigation to appear in the correct spot when viewing on a mobile phone. The navigation goes to the very left, however when you touch the icon nothing happens. And then if you press to the right of the site name, where it appears to be nothing there, then the navigation menu appears on the phone. The most recent 9 posts is all that is showing on my home page – I tried selecting only 2 or 3 categories in theme options, but it continues to show the nine most recent posts no matter what category they are. I too would like to know if there is a way to get older posts to show on the home page when selecting a category from the recent works menu. It’s sad to see just one or two boxes left when they select a category that doesn’t have a lot of posts on the beginning or “All” initial home page. Someone else mentioned sticky posts – how do I do that? I’ve gone in way over my head with some of the modifications I’ve made already – so you are talking to a newbie who doesn’t mind getting dirty with the technical jargon. Oh – one other issue – the background image I have – just a tiled texture – is mostly for people with a wide screen monitor. The design with all the content still has a plain white background, however, on the ipad it looks really goofy – the background is showing under the whole thing – I lost my white background for the content area. Where/what do I do to have the ipad settings just ignore the background image and use plain white? where’s the download link?i thought it’s free? The information in this article has been very interesting! I will be returning to read through future threads and have bookmarked this site. Keep up the good work! Hi. I’ve been playing with this theme and I noticed that on mine, and your demo, the pictures on the front page are ever so slightly off center. They align to the left. Look at them compared to the catagories bar and you’ll see what I mean. This happens in all browser that I have tested on a Mac. Can you help, is there something i can add to the style sheet? Thanks guys, these theme is beautiful and 99.9% perfect (just need to fix this little glitch). you can insert them into the posts, etc. You probably already knew that. “gallery” shortcode into your post. thanks for the great theme. is there any documentation please on how to (1) replace site name with logo? (2) reduce height of welcome message. thank you! When I activated the Mixfolio theme, it didn’t ask about installing any plugins. What plugins does it require please? I did not get any info upon theme activation about the plugins needed to run the theme. Where can I get such list? Help please! I’m using the amazing Mixfolio theme, but after installing the slideshow plugin and changing the permalinks the navigation menu at the top of all pages disappeared! Please help! Hi. First off I love this theme, so thank you! However, I am having problems. When creating a post I am not seeing the options for Standard, Image, Gallery, etc listed above, and when I create a post using gallery format they only show up as small thumbnails. On your sample they are larger. How can I change them from thumbnails? something happened to the theme after I updated to the latest wordpress (3.5.1) – I can’t set the featured image any more… is there a way to resolve it? I am really in love with this theme and don’t want to let it go..
heyyy sorry for my english.. i have this incredible theme too, but i dont understand why in the demo, the gallerie preview its with big photos and in my theme the images are small ??? and i need some plugin for create a slide o presentation of my pictures inside of the post… some idea..? thanks for this beautifoul theme.. from Barcelona.. Javier. with greetings of the day!!! In the version I’m currently using there is no ‘theme option’ to filter categories and there is no home.php file. Can anyone tell me how I can set only a certain category of posts to display on my front page? The template php doesn’t seem to be similar to other themes, so all the tutorials I can find don’t relate to mixfolio.